In a simple world, there would be a one-to-one correspondence between user stories, elementary processes and function point transactions. For example, “as an author, I can see a display of all of my posts.” This is an elementary process. It is also an External Output (EO), since there are values for the total number of comments. It looks like estimating is easier than we feared. However, the world of software development is seldom simple. First, the user story might not correspond to an elementary process. Some stories are simply technical, indicating that the user will be interacting with a pleasant screen. Epic stories usually correspond to several elementary processes. Unfortunately, sometimes several elementary processes are covered by the same transaction. For example, one elementary process might be to display the list above and another might be to print it for an administrator. Upon analysis, you may realize that the same data is used in both cases. It is sized as a single External Output (EO). Most of the time, when changing an output screen. this does not become an issue. You will have already addressed these situations when you performed the Adding an Output Screen procedure. However, there are times when this may not have occurred. For example, you might be estimating the second or subsequent release of an application when the first release was done using a different or no estimating approach. Another situation where this could be happening is where you are enhancing an application that was not subjected to any function point analysis. In these cases, you will have to use the principles outlined in Adding an Output Screen to identify the function point transactions in the original application. Once you have identified the transaction, there is a question of whether the change is a substantial functional one. Agile development teams sometimes use various types of stubbing. They may envision the output screen above. However, this is going to part of release 3. In release 2, there is simply a list of posts. In release 2, this listing could be considered a stub. When release 3 is being estimated, then the report should be estimated as if the team were Adding an Output Screen. This should be done any time the estimator feels that the team is “going back to the drawing board” to change some functionality. Note that functional changes always alter the information that is crossing the application boundary. When new Data Element Types (DETs) are added or removed, this is a functional change. 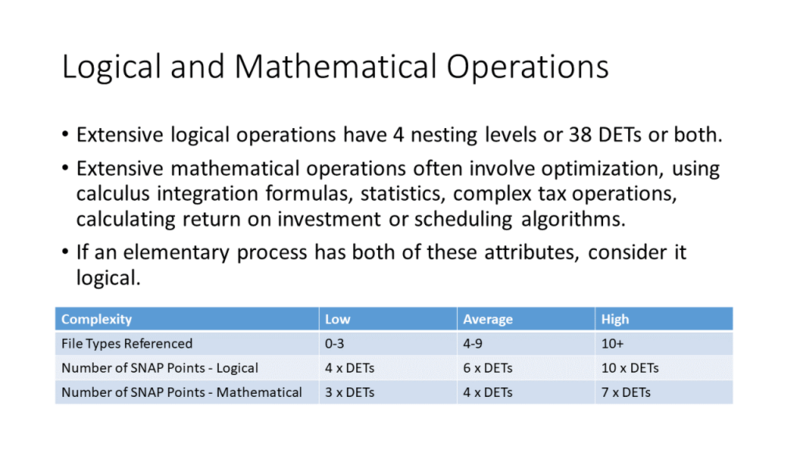 Changing the way a DET is derived is a functional change, provided that a different value is calculated. Changes to the method of calculation, like to increase performance, is considered technical. Theoretically, an application could be developed with no data entry validation. Input would have to be valid, or the application would not work. Therefore, most applications check to see that numbers, and dates are valid. 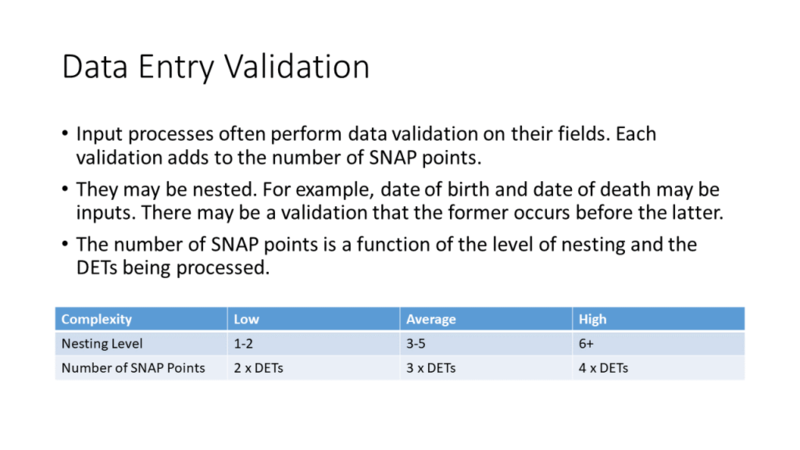 If these validations are being added as a change, then SNAP points are counted. If they are part of a small functional change, then add the SNAP points. Every DET that is being validated should be counted. Note that this is irrelevant for most of an output screen. It is only counted if there is a selection criteria for the screen where there are input DETs that are validated. Some output screens are simply more complex than others. They take longer to develop or change. First consider logical complexity. If there are 38 DETs or more, then the output screen is logically complex. If there is logic that involves 4 or more levels of conditional testing it is also considered logically complex. If the output screen is logically complex, there is no need to check for mathematical complexity. Mathematical complexity occurs when a output screen utilizes complex mathematical algorithms. This is typical of scientific applications. Many business applications also involve optimization, statistics, scheduling and some tax calculations. 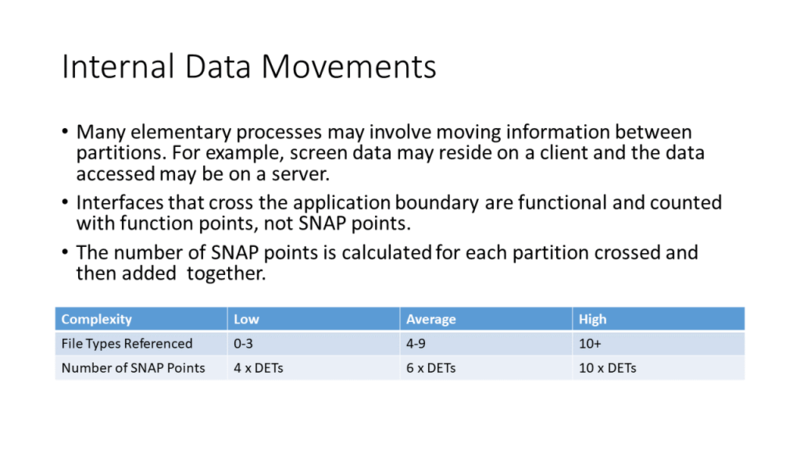 SNAP points are a function of the number of File Types Referenced (FTRs) and DETs. 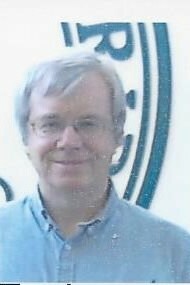 If an output screen was changed to perform a regression on some of its data. If that change added 2 DETs and referenced 2 logical files, then 6 SNAP points would be counted. The 2 logical files would indicate low complexity. This would mean that 3 times the 2 DETs would be counted for the complex mathematical operation. 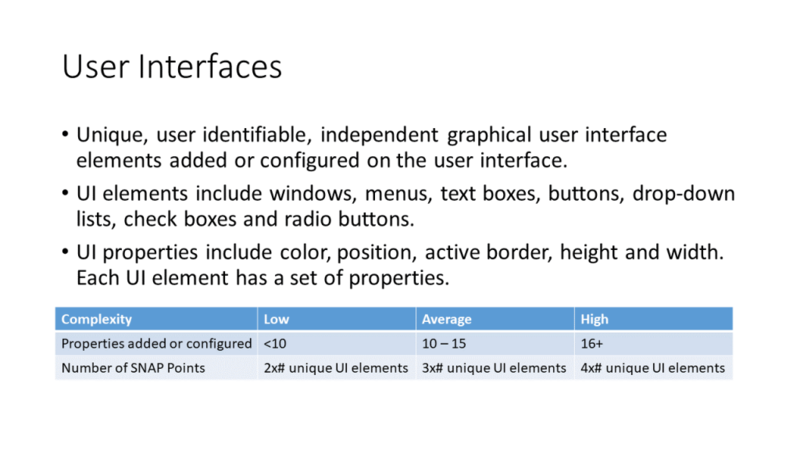 Changes to graphical user interfaces do not always involve a functional change. For example, if there is a drop down that is going to be replaced with 6 radio buttons, the functionality is the same. However, there is effort involved in performing this technical change. It can be sized in SNAP points. As a practical matter, even small functional changes are more accurately captured in this manner. An output screen can be part of a Multiple Output Methods. If the same report can be displayed on a screen or faxed to a client, then it is only one External Inquiry (EQ) or External Output (EO), depending upon the criteria described in Adding an Output Screen. 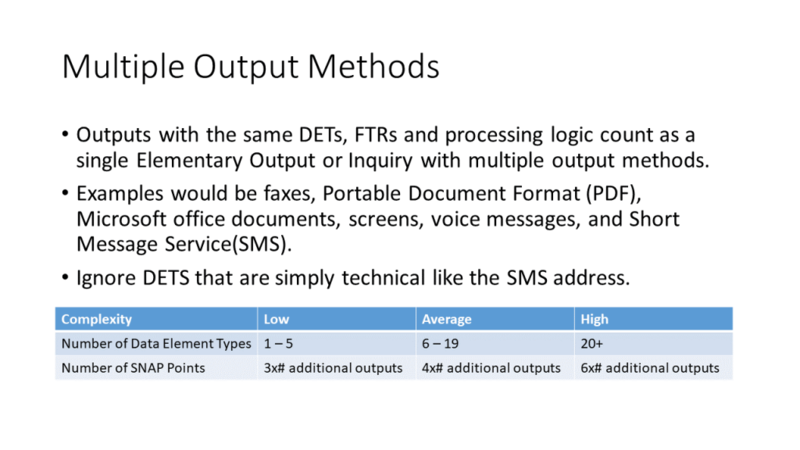 Adding or changing the fax capability would be a change to that EO and be sized in SNAP points using the matrix below. Sometimes an application must operate in several environments. For example, a web application might be required to work in both Chrome and Firefox. Usually, only a subset of the elementary processes need to do this. The forms should work in both environments, but batch jobs might run on a single platform on the server. If you are changing an output screen so that it operates on multiple platforms, then count SNAP points for sizing purposes. 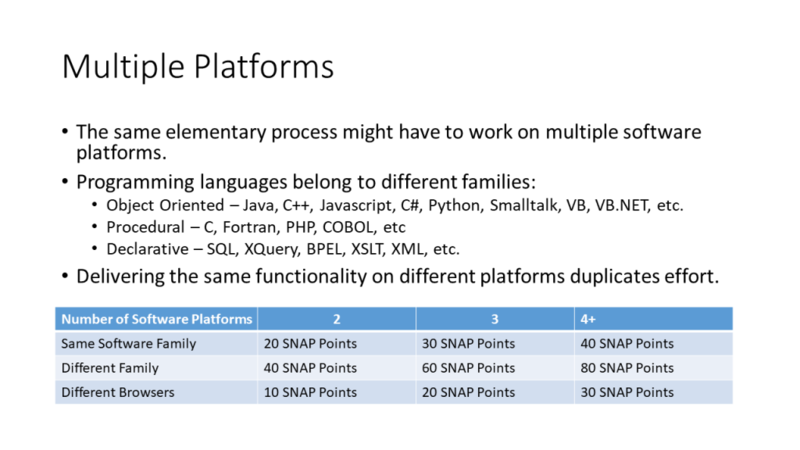 If different browsers are to be used, then use the table below to assign SNAP points based on the total number of browsers that must support the elementary process. When an output screen changes, it is often associated with a change to the databases it is referencing. 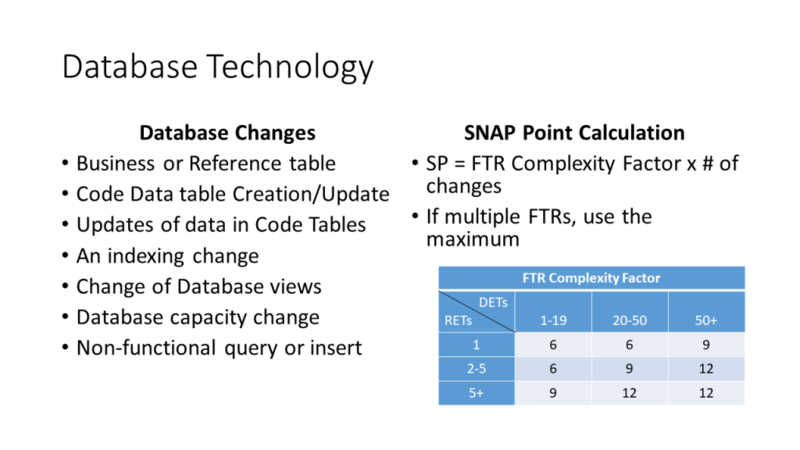 The types of database changes are on the left side of the slide below. Calculate the SNAP points considering each of the file type referenced (FTRs) that has changed. 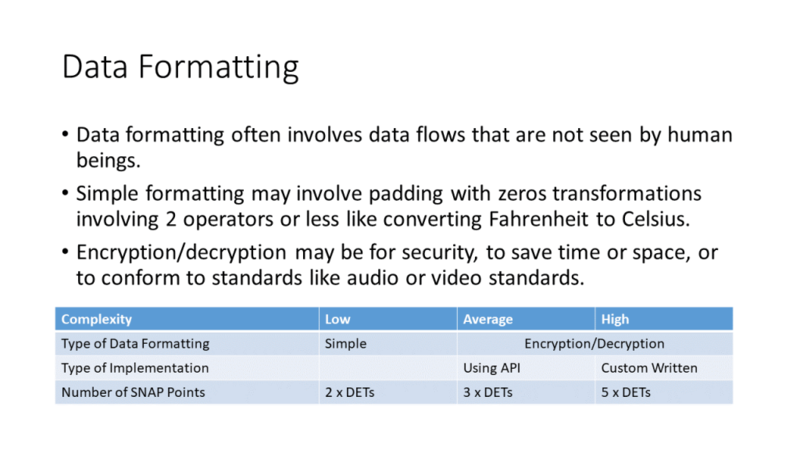 Use the chart on the right to establish a complexity factor based on the on the number of data element types (DETs) and record element types (RETs) of the file. For each file, calculate the SNAP points based on the number of database changes that occur. 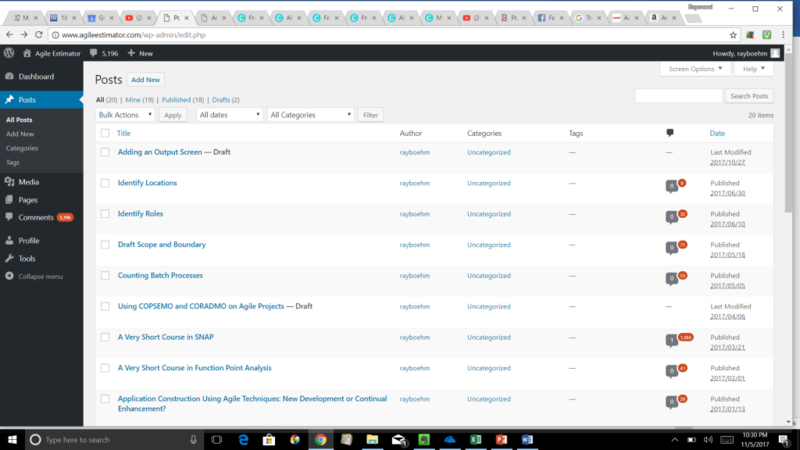 For example, if a logical file had some new fields added and the database was indexed on one of them, then it would be a two database change. If it was a low complexity file, then 12 SNAP points would be added. If several of the file types referenced change, then the SNAP points for each is calculated, but only the maximum value is added to the SNAP points for the elementary process. Also note that code tables are considered here, even though they are not counted at FTRs in a function point transaction. If the output screen is implemented using one or more software components, then add 3 or 4 SNAP points for each component, depending whether it is in-house developed (3 points) or third party (4 points). In-house components are often application program interfaces (APIs) that facilitate communications with other applications. 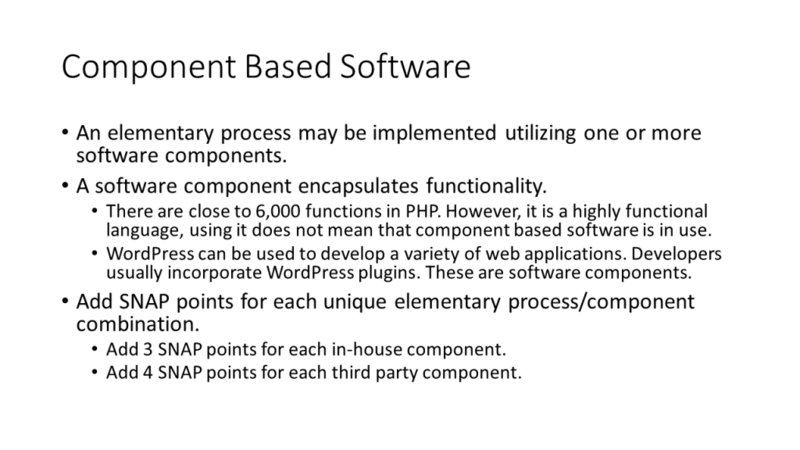 Third party components are often purchased components that supply some functionality, like WordPress plugins.